Over the summer, pioneering climate scientist James Hansen and his colleagues penned an apocalyptic study predicting that the deadliest consequences of climate change will be felt within decades. That paper precipitated a raucous debate, but now, it’s been accepted for publication, heralding a sea shift in attitudes toward climate studies that make dire and outlandish predictions. And we’re not kidding when we say dire. The paper forecasts collapsing ice sheets, epic superstorms, even mega-boulder-hurling mega-waves. (If you don’t believe me, check out the entire subsection devoted to said mega-boulders.) Most significantly, the study predicts that we’ll begin to feel these climate consequences within a few decades rather than a few centuries. Also, that the 2 degree Celsius climate warming benchmark bandied about by scientists and policymakers is extremely dangerous. In a nutshell, here’s how all of this works. It starts with melting of the Greenland and Antarctic ice sheets, something we’re already beginning to see. As cool, fresh meltwater pours off of the ice sheets and into the ocean, it creates a stratified layer that floats atop warmer, denser ocean water. This, in turn, disrupts the ocean’s normal “overturning circulation” pattern, which mixes the entire water column and allows heat energy accumulated at depth to be redistributed to the surface. Trapped in the deeper layers of the ocean, warm waters eat away at the bottoms of the ice sheets, leading to more rapid melting and eventually, catastrophic destabilization. This causes even more freshwater to enter the surface ocean, resulting in more sea level rise (several meters over the course of the century, Hansen predicts) and more thermal stratification. Suddenly, we’ve got ourselves in a nasty feedback loop that results in the complete shutdown of major ocean energy currents. A shutdown of the North Atlantic Overturning Circulation, which brings heat energy to western Europe and eastern North America, results in regional cooling, even as global warming heats up the tropics. The growing temperature differential between mid-latitudes and the equator drives some of the more apocalyptic climate change consequences discussed in the paper, including more frequent and intense superstorms, accompanied by waves capable of tossing hundred-ton boulders into the air. Strictly speaking, the idea isn’t new. In fact, Hansen’s predictions are modeled after events that geologists and paleoclimate researchers believe took place during the Eemian, a period some 80,000 to 130,000 years ago when the Earth was only slightly warmer but sea levels were 6 to 9 meters higher than they are today. 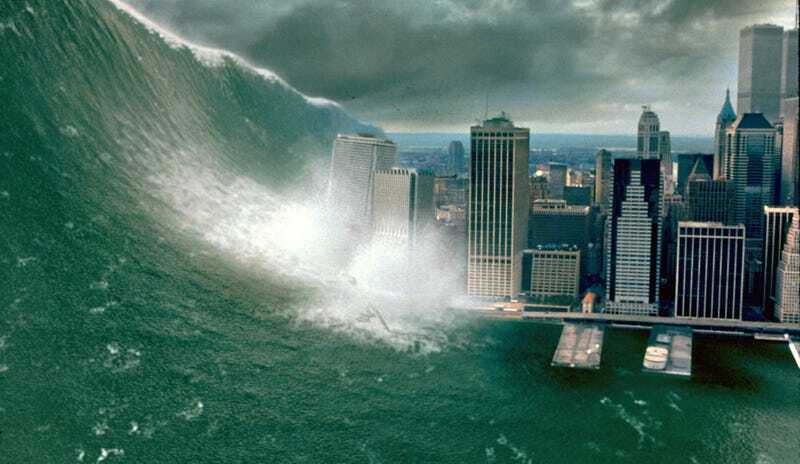 It’s also—loosely speaking—the climate disaster scenario that inspired The Day After Tomorrow. Hansen’s paper was first released online and publicized over the summer, before the peer review process was complete. A high profile debate ensued, in which Hansen and his co-authors were criticized for sharing their findings with journalists before the study had gone through academic review. Hansen, a former NASA scientist who famously brought climate change to the public’s attention during a congressional testimony in 1988, has become a political activist in recent years, leading some in the scientific community to worry that he’s lost his objectivity. While he’s not the only climate scientist frustrated with glacially slow pace of political action on climate change, scientists who turn to activism risk opening the broader community to criticism.